Parents have been leaving notes in their kids snacks and lunches since the dawn of time. 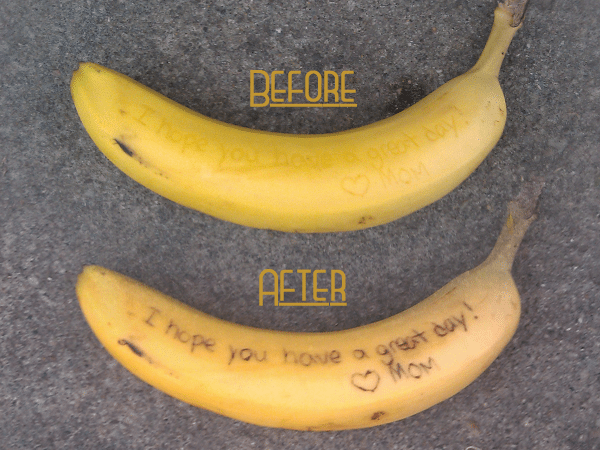 You probably remember a cute or cheesy note that your mother snuck into your school lunch, but was it creative as well? It is so simple to make a creative and cute note that will surely make your child smile. It could also be a fun little gift that you can help your child create and give to dad to take for lunch. All you need is a banana and a toothpick! Scratch a loving or funny note onto the banana, and they may not even see it at first, but as the day goes on and lunchtime rolls around, the letters will turn brown and the “secret message” will become clear. If that isn’t a great way to use a banana, I don’t know what is, but just in case, here are some more things you can do with bananas. Make homemade banana butter to spread on your toast. Rub the skins on your teeth to make them whiter. Banana Split Bites are a surefire hit with the kids! Treat warts with the peels. Grab some Nilla Wafers and make some BaNilla Bites. Froze Banana Bites are sure to cool you down on a hot day! Banana Cinnamon Waffles are a great way to start the day. If you need a fun after-school snack, try Banana Boats. The inside of banana peels will aid in making a bruise disappear. Rub gently. If you’re over 21, you can try out Banana Bourbon for a nice little kick. Rub a banana peel on acne to help clear your skin. If you need a gluten-free breakfast, try these Paleo Banana Pancakes! Researchers have found that drinking boiled banana peel water can ease depression. Mix yourself up some delicious banana chia pudding for a snack. Your kids are sure to love this adorable (and yummy!) Teddy Bear Toast. And of course, there is always Banana Nut Bread, which is always a crowd pleaser. If you’ve done all of the above, and still have more bananas, use up your extras in these recipes. I love baking with bananas (more than even eating them) – this is a great post! How awesome, just saw you linked to my banana pancake recipe, #15! Thanks so much for sharing these gluten free yummies with your readers. Bananas are great, I always do as #8 suggests for my roses. Similar to #12, the inside of a banana peel eases burn pain instantly. I’ve had to test this many times when cooking and using the glue gun for crafts.